Bright and energetic, Lea wants to live forever in the memories of every person he meets. He tends to leap before looking, leading to some messy situations. Nevertheless, he taught Ventus the importance of making friends. He and his best friend Isa have big plans for the future. Lea and Isa find Ventus sulking and Lea sees the wooden Keyblade Ventus received from Terra. Lea asks Ventus if it was his and teases him for playing with toy swords. He decides to show Ven a "real" weapon and takes out his Frisbees, challengeing him to a duel which finally cheers up Ven. Ven clearly had the upper hand, but Lea tries to escape by calling it a draw. Isa points out that he was obviously losing. Lea complains that he's not doing a good job of being his best friend, since he should be cheering him up instead of adding insult to injury. The boys laugh at his comments and talk a little longer. Lea tells Ventus that they'll meet again someday because they are friends now. Afterward, Isa and Lea head toward the castle and declare that they are ready to execute their plan. With a personality as fiery as his hair, Lea was reborn shortly after Axel perished defending Sora from the onslaught of Dusks. He awakens in his home world of Radiant Garden in the all too familiar attire of Organization XIII, completely distorted and confused, in the company of four individuals who had been the founding members of Organization XIII in another life: Dilan, Even, Aeleus and Ienzo. He quickly realizes that they are no longer the same people who've traveled throughout various worlds doing recon and stealing hearts. However, along with that is the haunting feeling of someone missing. 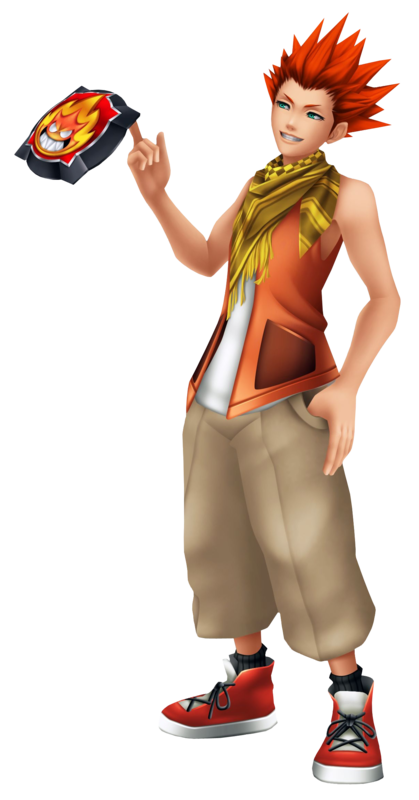 Xehanort of course wouldn't have returned to Radiant Garden if he were in the same boat, but Braig and Isa should have been. As Ienzo and Aeleus look through Ansem the Wise's study and Dilan and Even rest in the unstable conditions, Lea searches the castle for them, even though he knows the effort is in vain. Returning to the study, he consults with Ienzo and Aeleus on the next course of action. Catching a glimpse of the remnants of the old password to Ansem's computer, he decides to change his course and head in a new direction, of which he did not disclose to the other two. It turns out that this direction was in fact that of the heroes of the Realm of Light, as Lea proved by sending a chakram through the Dark Corridor right in the nick of time to rescue Mickey, Donald and Goofy from Maleficent's flames, letting them turn the tides in the confrontation. He leaves Disney Castle with them and departs to the Mysterious Tower, where he then requested something rather unexpected from Master Yen Sid. Catching up to speed on the situation regarding Sora and Riku in their Mark of Mastery exam, he does not hesitate to jump right into the fray to help the cause, and heads to a place specially prepared to undergo training with Merlin and the Three Good Fairies without the constant nagging reminder of time in order to make the most of his special request. This training was worth every minute, allowing Lea to burst in right at the nick of time to save Sora from his dire fate as Master Xehanort's thirteenth seeker of darkness. His moment was short-lived however, as Xehanort sent one of the other seekers to attack him. To Lea's shock and disbelief, this seeker was revealed to be none other than Saix. To see his once proud childhood friend reduced to a vessel for Xehanort; he was taken aback. Returning to the Realm of Light, Lea could do nothing but watch as everyone huddled around Sora, sent into a deep slumber with his heart lying deep in the shadows. As Riku proclaimed that he'd be the one to wake him up, Lea confidently calls out that he'll be there to rescue him if need be. After all, "Dark Rescue" is his middle name. That was unnecessary however, as he returned with Sora unscathed. The collective party waited eagerly for Master Yen Sid to announce the results of the exam. When Riku was declared the new true Keyblade Master, Lea confidently said that he'd be able to catch up in no time. It was then that he revealed his new goal to be a Keyblade Master, and for the first time, was able to call his Keyblade into the world, shocking everyone around him. Even the great Master Yen Sid who had granted him the power to wield in order to help him help his friends was shocked beyond belief. With new promises to keep and a brand new Keyblade to show off, Lea hurried back home to Radiant Garden.